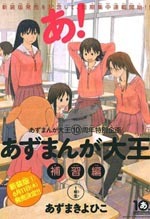 To celebrate the 10th anniversary of Azumanga Daioh, the manga is being repackaged into a new three-volume set, which will include three chapters of new material called Supplementary Materials. Each new chapter covers one year of high school, with all new adventures (!?) for Sakaki, Yomi, Tomo, Chiyo, Osaka, and Kagura. Thank you, unfortunately I'm suffering again the "BAAAWWW AZUMANGA IS OVER" syndrome. Yeah, it's sad. :( I'm glad you enjoyed it, though! awesome Awesome AWESOME! I love you for doing this :D Butjust like the above person I'm going through "Azudaioh End' phase again OTL I swear I could read about those girls forever. thanks for these man, love azumanga daioh, and these new ones should be a fun read. Thanks for the chapters, link for Chapters 1-3 doesn't work though, there is point at the end of the link address. Oops. Thanks, I've fixed it! Hmm, I don't know what happened. It's definitely fixed now, though. Wow, thanks so much for doing this. I had no idea that he did 3 extra chapters… this is sweet (temporary) relief for those end-of-Azumanga blues. Thanks for doing this! It was fun getting to laugh and then break my heart all over again! Just great and it has been that long, big wow. one of the first ones to get me in on these things. I read the entirety of the original over about a week, and felt empty inside after I'd finished it, I didn't realise so many other people felt the same. Thank you for doing this, the end-of-Azumanga blues have been alleviated for a bit at least! I'm glad Kaorin made a few more appearances too, I was kinda disappointed she didn't show up that much in the original.